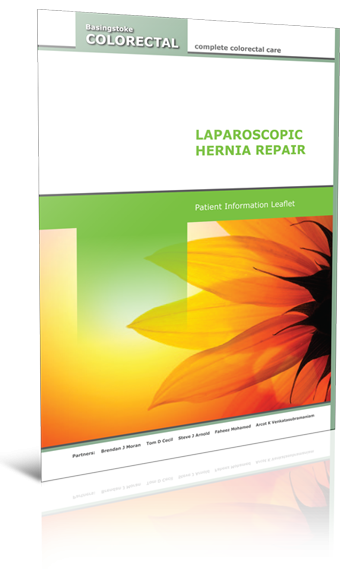 Laparoscopic hernia repair is a procedure aimed at minimising the invasiveness of surgery and is a specialised technique for performing surgery. Laparoscopic surgery uses several small incisions, typically 0.5-1cm in size. Each incision is called a ‘port’. At each port site, a tubular instrument is inserted and specialised instruments and a camera are passed through these during the procedure. At the beginning of the procedure, the abdomen is inflated with gas to provide a working and viewing space for the surgeon. The laparoscopic camera transmits images from the abdominal cavity to a high resolution video monitor in the operation theatre. During the operation, the surgeon watches detailed images of the abdomen on this monitor. This system allows the surgeon to perform the same operation as traditional surgery – where typically a larger, single incision is used to enter the abdomen – but with smaller incisions. We use the laparoscopic hernia repair technique to repair an inguinal (groin) hernia and this is called TEP (Totally Extra Peritoneal repair) and incisional hernia (hernia through previous operation scar).